The last time I saw my doctor, I arrived about 12 minutes early for my appointment. She arrived 22 minutes late, to find me waiting outside of her locked office. Which means I'd been there for over half an hour before I even saw the waiting room. Now, I appreciate the test of both my patience and my blood pressure, but it seriously cannot continue to take me three hours to get a prescription filled. In the wise words of Sweet Brown: Ain't nobody got time for that. Listen, very few of us have time to just hang out in a waiting room--and after this last appointment, I know I'm going to avoid actually going into the doctor's office unless absolutely necessary. Fortunately, a variety of mobile apps have my back, enabling me to get free medical tips, verified advice, and even consult with medical professionals from my phone. Which means that the next time I need advice about migraine prescriptions, I can handle it in minutes on the bus ride into work. If you also want to minimize your time in a waiting room, check out these handy health apps. This app does just what the name says: Helps you consult with a qualified, U.S. Board Certified doctor by phone or secure messaging anytime, anywhere. There is a catch, however, and it is that iDr. 24/7 is affiliated with a service called Consult A Doctor, which itself is affiliated with several insurance plans and health services. If you're not already a member of a participating health plan, you'll need to call them to assist with your registration--which may still be easier in the long run than trying to set up a last minute appointment over 4th of July. The app gives you four options for contacting a physician. Choose "On Call" to immediately connect to a doctor for answers to questions, advice, or recommendations. Pick "Priority" to have a doctor return your call in about 30 minutes (call back is guaranteed within 3 hours), and you can get a diagnosis, treatment plan, or prescription--including refills. You can also make an Appointment, which is much like the Priority option, except that the doctor calls during a scheduled time (Monday through Friday). Lastly, the E-consult option lets you consult with a doctor using the secure messaging service to get a expert information and answers to your question within two hours (guaranteed within 24 hours). While the app itself is free, the services, sadly, are not. E-Consults are $11, and the On Call option is $15. The Priority and By Appointment options start at $21, but if you want a video consult with either of those, that's an additional $26 charge. iDr 24/7's My Health Center feature offers free information on the latest health topics, medications, medical tests, and support groups. This app allows users to ask a doctor a specfic question and wait for a reply (for free), or get an expedited answer (for a buck). Before the question is sent off, the app will also provide you with several possible answers related to the health question and symptoms described. HealthTap holds a wealth of free information on many physical ailments, described in detail in prewritten answers from around 35,000 licensed doctors. 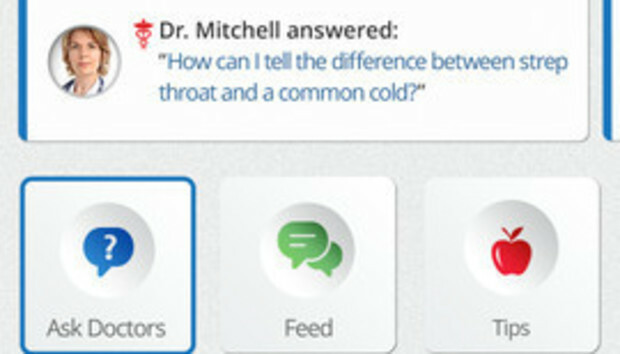 Information and opinions are given by topic, so users can see responses from different doctors and can consider different opinions. HealthTap can also store information from doctors of your choice, and help find you doctors in your area so you can schedule an apppointment. Additionally, the app provides daily health tips on a variety of topics, as well as answers to questions about symptoms, conditions, and medications. HealthTap has a section for you to store your health information so that you can access it quickly and share data with your doctors--including scans, images, and health-related documents. It does require you to log in or create an account (in order to keep your data secure), and then asks for basic information about you as well as which three health topics you "care most about." The app then personalizes for your choices and can email you newsletters about those topics. It's also nicely organized: The top of the app provides you access to your notifications, and a Settings menu gives access to your profile, activity, health files, and further settings. You can pad your profile information with details on your height, weight, blood type, insurance infromation, medications, allergies, procedures, pharmacy information, and more, so the app can provide you with the most accurate information. HealthTap also has a search bar, an Act Now button that lets you ask a question, send a message, update your profile, follow a question that has been asked, or send a file. The Ask Doctors button gives you information on the fee options (again, free or $1) as well as a link to tips, conditions, and symptoms, using a model where you tap a body part to narrow down relevant symptoms. Additionally, the app has advice on eating healthier or excercising more, and a Medications tab where you can search various medicines, add them to your profile, and see related questions. Overall, it's a really extensive app that provides a lot of detailed information and lets you create a complete personal profile. This app is designed to take the place of going to an urgent-care clinic, but clearly states that you should go to an ER for medical emergencies. What it will do is connect you to medical professionals within 30 minutes--albeit for a fee. For $3.99, a nurse calls to talk about your health concern, then determines if you need to speak with a doctor, who will try to help remotely (with a simple prescription), refer you to a live doctor within a day, or tell if you if you should immediately go to an ER. The app also offers a very user-friendly medical dictionary and encyclopedia, and a program where users describe symptoms to discover possible diagnoses on their own. You can search for information alphabetically, by symptom, or by clicking on a body part. Looking up a symptom will provide you with causes, risk factors, signs and tests, treatment, support groups, complications, prevention, and more. At any time, you can tap the Call Urgent Care button to be connected to a registered nurse in your state (who can then have the doctor call you) for $3.99 which is a lot cheaper than having your roommate haul you to the ER. The app also provides additional security by way of a personal PIN protecting your medical information. A well-known and comprehensive program created by two ER doctors, iTriage gives a plethora of health care information. Users input symptoms and complaints to discover possible diagnoses and locate physicians in their area--it can even provide the current average wait times at some ER facilities. You can also use iTriage to set appointments for select providers, access healthcare hotlines, and save whichever healthcare information you desire. You can search for answers to health questions, and learn about symptoms and potential causes while the app helps you find the most appropriate treatment center or doctor. The app can find you the closest hospital, emergency room, urgent care facility, clinic, pharmacy, doctor, community health center, and more. The Doctor Search features helps you locate physicians quickly, and also provides information on thousands of symptoms, diseases, conditions, procedures, and medications. The app will provide you with the phone numbers to emergency hotlines and physician/nurse advice lines, should you, say, need the number for poison control. You can "check in" from the app when you're on your way to select emergency rooms and urgent care facilities (and get the average wait time), as well as use the Appointment Setting for select doctors, and save your personal health information in the Personal Health Record tab. Remembering when you have a doctor appointment and what you need to bring with you can be a challenge--especially if you're seeing multiple physicians. This app aims to solve the hassles of scheduling by allowing users to set an unlimited number of detailed reminders that include doctors' names, hospital and clinic details, and appointment notes. It can also send SMS messages and email to your doctors. Granted, it cannot provide medical information or health tips, but it can ensure you make your appointments via the real-time alerts. The app manages all types of medical appointments including lab tests, physical therapy, and fitness/nutrition appointments. You can also record voice notes and save photos. The app has custom fields for medical information you might need to remember, and all data is stored locally on your device, so it's kept as private and secure as your mobile is. It's fairly simple and straightforward: The app asks for your doctor's name, specialty, a due date, a due time, and priority and then gives you options to add photos, play or record voice memos, and make notes. In the upper-left corner there's a box that says ICE+ (In Case of Emergency) where you can list your emergency contacts. Additional tabs store info on your conditions, allergies, and medications, while the bottom menu lets you see upcoming appointments, email them to others, and adjust the notifications. A bonus offering is the Online Care Mobile App from American Well, which lets you send and receive private messages from your doctor, see your test results, and arrange appointments. Physicians use the app to not only send messages and see appointments, but also see who is in the waiting room. This all sounds great--like the future of both medicine and technology--but the app is intended primarily for physicians. Patients can use this app only through their insurance or pharmacy companies, and providers must be credentialed and have an account with the service. So this is great if your doc is tech friendly and willing to try it out, but for the rest of us it's as elusive as the cure for the common cold. Is Apple better or worse without Steve Jobs?